Before the Insolvency and Bankruptcy code, 2016 there was no special law to regulate Insolvency and Bankruptcy in India. 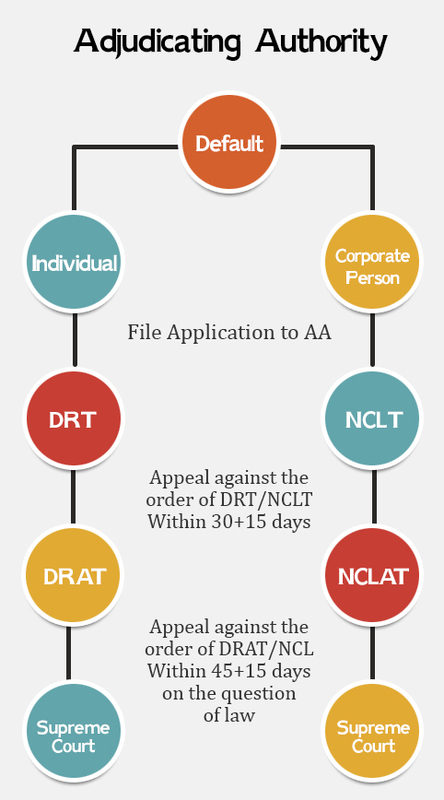 Various laws were enforced to regulate Insolvency and Bankruptcy system in India.The Presidency Towns Insolvency Act, 1909 and Provisional Insolvency Act, 1920, Companies Act, 2013,Sick Industrial Companies (Special Provisions) Repeal Act, 2013,Limited Liability Partnership Act, 2008, Secularization and Reconstruction of Financial Assets and Enforcement of Security Interest Act, 2002,Recovery of Debts Due to Banks and Financial Institutions Act, 1993 and, Indian Partnership Act, 1932 regulated the matter of Insolvency and Bankruptcy of Individual and Corporate person. Any company incorporated under the Companies Act, 2013 or any other previous law. The code extends to the Whole of India. PROVIDED THAT the provisions applicable on the Partnership Firm and Individual person shall not apply to the state of Jammu and Kashmir. One member which shall be nominated by Reserve Bank of India. Five other members which shall be nominated by Central Government in which at least three members shall be whole time members. Insolvency professional agency shall be a section 8 company incorporated under companies Act, 2013. Any section 8 company wanting to become an Insolvency Professional Agency, is required to get itself registered with the Insolvency and Bankruptcy Board of India as per section 201 of Insolvency and Bankruptcy Code, 2016. Thus, an Insolvency Professional Agency shall take a Certificate of Registration from the Insolvency and Bankruptcy Board of India. Grant membership to the person on payment of membership fees. The Insolvency Professional Agency may suspend or cancel the membership,if any member does not fulfills the criteria specified in the regulation and bye-laws. The Insolvency Professional Agency shall redress the grievances of members. Every Insolvency Professional Agency shall make bye-laws for standard of Professional Conduct of the members. Sir can you please elaborate the point 2 of the list of applicability i.e. other company governed by special act, as there is specific exemption for Banks, financial institutions, insurance companies. So what are the type of companies will be covered under point 2 (two) ???? Exception to this section is that The Code shall not apply to Financial Service Providers like Banks, Financial Institutions and Insurance companies. So it can be said that IBC 2016 is applicable to all companies incorporated under Companies Act or other special acts of parliament or state legislature like electricity companies except financial services companies. Whether presently IBC is applicable of Cooperative Societies established under Cooperative Society Act of the State? Whether IBC is also applicable on Associations?